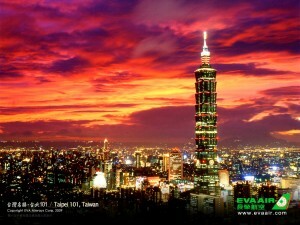 Fly from New York City to Taipei with EVA Air. Taiwanese airline EVA Air completed the first flight of its new route from Taipei, Taiwan into JFK International Airport in New York City on Monday. The airline is operating flights between the two cities on Mondays, Thursdays, Wednesdays and Saturdays. Through Taipei’s Taoyuan International Airport, travelers can access 17 cities in China and dozens more business and leisure centers throughout Asia. EVA’s Boeing 777-300ER departs from New York at 11:50 p.m. and arrives in Taipei at 7:20 a.m. local time. The nonstop return flight departs at 7:30 p.m., arriving in New York at 10:00 p.m.
For more information or to book tickets, call EVA toll free at 800-695-1188 or visit the airline’s website. To read articles about Asia and Taiwan, visit GoNOMAD.